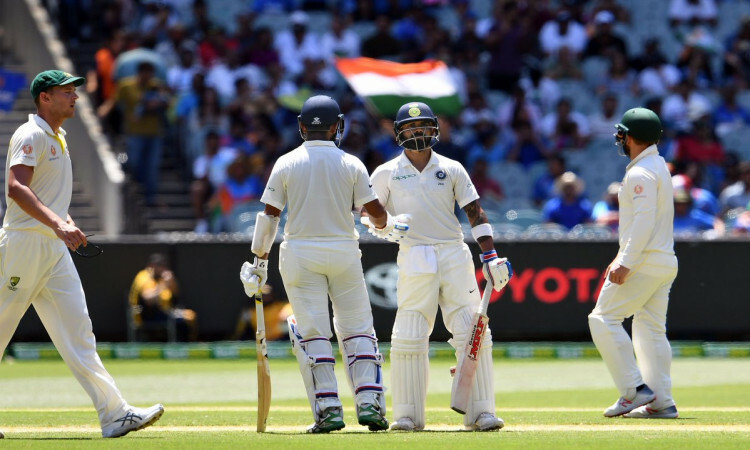 Melbourne, Dec 27 (CRICKETNMORE): India declared their first innings after scoring a mammoth 443/7 to leave Australia with just seven overs to bat on Day 2 of the third Test at the Melbourne Cricket Ground (MCG) here on Thursday. India's massive total was powered by a classic century from Cheteshwar Pujara (106) and half centuries from skipper Virat Kohli (82), debutant opener Mayank Agarwal (76) and Rohit Sharma (63 not out). To add to Australia's woes, vice-captain Ajinkya Rahane (34) and stumper Rishabh Pant (39) also got decent starts but more importantly, were engaged in crucial partnerships with Rohit. For the hosts, pacer Pat Cummins emerged the hero with the cherry, returning with figures of 3/72 on a docile MCG track while Mitchell Starc contributed with two wickets. Josh Hazlewood and lone spinner Nathan Lyon worked hard for their one wicket apiece. Brief Scores: India 443/7 (Cheteshwar Pujara 106, Virat Kohli 82, Mayank Agarwal 76, Rohit Sharma 63 not out; Pat Cummins 3/72) vs Australia.